For all intents and purposes there is nothing here that we haven’t already seen or don’t already know. About all we get from this is the already assumed idea that the Motorola Cliq XT is designed for the “Connected Socializer.” Honestly, was there anyone out there who didn’t assume that from a phone running the love it or hate it MotoBlur Android system? Enjoy the pretty picture. I just upgraded to new mytouch3g but will look into this one when it comes out. Motorola used to be sketchy but they are doing nicely on their android devices. I would want this to be a bit cheaper than cliq with keyboard if specs are same, if its more powerful then same if not more imo. That was totally stupid and uncalled for….ignorant! My bad, I thought google had to “tweek” it or whatever for the cliq. This is why I’ll remain a “stock android” user, I’ve seen motoblur, and Sense in person, and while they both offer a unique and interesting UI experience I don’t want to have to wait for Google to release an update, then for the OEM to update their UI to work with the newest version of Android. By the time these phones get 2.1, Google will probably be getting ready to drop 2.2 or 2.5 or whatever the next release is, so you’ll always be behind everyone else. Sorry, the phone is ugly. You know… if the Motoroi never shows I might be interested in this phone so long as it has Swype. More memory would be a plus and as long as they promise to put 2.1 etc. on it… this might be looking into. I like how they added a flash to the camera. It still would need muti touch though so I can play the emulators too. Any idea when and if any other Android phone will get muti touch besides the Nexus One? To me this is important if you want to play the games and you don’t have an actual keyboard. Is the processor the same as the current cliq or did they update it? I want an Android phone with the snap dragon… and so far the only one with it is the Nexus One. Not tickling my fancy…but it’s all good. The more i read about this the phone, the more it seems like a nice upgrade to the Cliq. 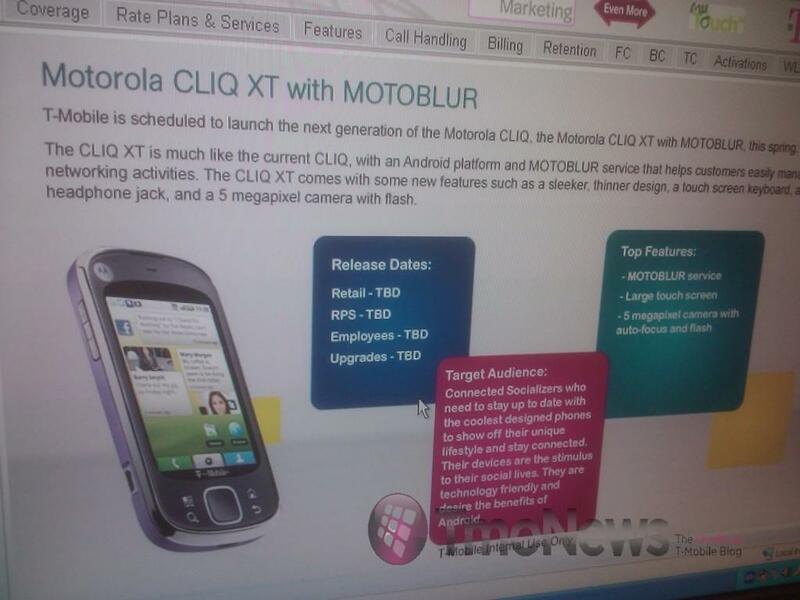 My guess is that if the Motoroi does land it won’t be out until have the Cliq and Cliq XT gets the update to Android 2.1. Which probably won’t be until Summer from the way I see it. It would make sense if they sell these phones first then release the big guns with 2.1 w/ Motoblur and all the bugs worked out. Just a long wait for me though. IMHO, any custom UI phones should have an option to upgrade (downgrade?) to stock Android, including framework. Removing widgets is not an answer. Just my 2 cents. WHY DO YOU GUYS CARE SO MUCH ABOUT VERSION NUMBER? do you guys have to have the best of the best? What’s with the complaining? You want me to tell you guys the truth? THERE IS BARELY A DIFFERENCE WITH 1.6, 2.1, 1.5 YAH. MOST OF US PROBABLY NEED A SMART PHONE THAT IS GOOD, AND ANDROID IS THat.